TH-positive cells in mesencephalic cultures from WT and D2R−/− E14 mice and the numbers of TH-positive cells after treatment with MPP+. A, Representative photomicrograph of wild-type control (CT), D2R−/− control, WT exposed to 10 μm MPP+ for 24 h, and D2R−/− exposed to 10 μm MPP+ for 24 h. Scale bar, 50 μm. B, Percentage of number of TH-positive cells from mesencephalic cultures from WT (n = 5) and D2R−/− (n = 7) embryonic mice after treatment with 1–10 μm MPP+. The data are presented as the mean ± SEM. ∗∗∗p < 0.001 represents the result of paired Student's t test for control versus MPP+-treated cells. ††p < 0.01 and †††p < 0.001 represent the result of unpaired Student's t test for WT versus D2R−/− mice. 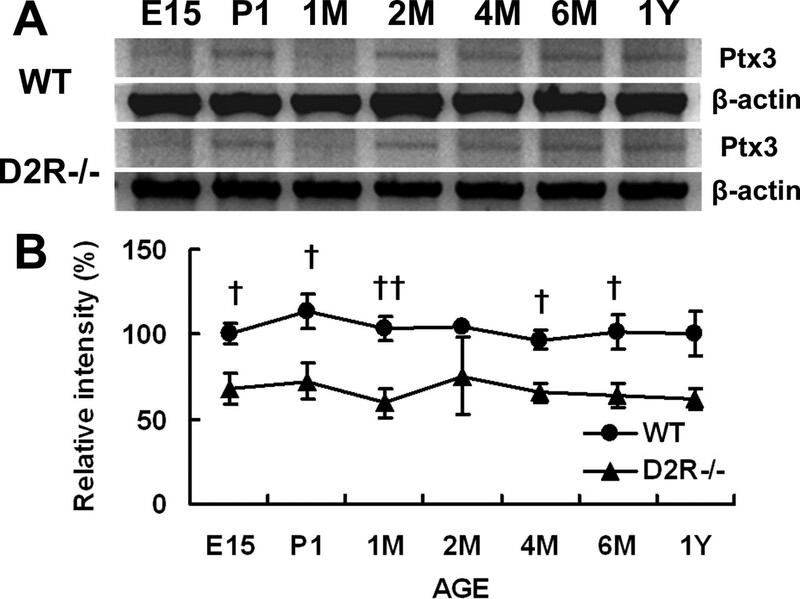 Stereological analysis of number of TH- and Nurr1-positive cells in WT and D2R−/− mice. A, The sections were prepared from WT and D2R−/− at E14 and P30 stages, respectively. Representative coronal sections with TH-positive cells in SN and VTA visualized by immunohistochemistry are shown. Scale bar, 300 μm. TH-positive cells in the mesencephalon of E14 stage mice and in the SN and VTA of P30 stage mice are counted using stereological methods involving an optical fractionator. The data (n = 5 for E14; n = 3 for P30) are presented as the mean ± SEM. †p < 0.05 represents the result of unpaired Student's t test for WT versus D2R−/− mice. B, Representative coronal sections with Nurr1-positive cells in SN and VTA visualized by immunohistochemistry are shown. Scale bars: left panels, 400 μm; right panels, 200 μm. Relative number of Nurr1-positive cells in the mesencephalon of E14 stage mice and P30 stage mice are counted using stereological methods as mentioned in Materials and Methods. The data (n = 3 for E14; n = 4 for P30) are presented as the mean ± SEM. Developmental expression of Ptx3 mRNA in WT and D2R−/− mice via reverse transcription (RT)-PCR analysis. A, RT-PCR analysis for Ptx3 transcripts was conducted at various developmental stages from the midbrains of WT and D2R−/− mice. The developmental stages analyzed were E15, P1, M (1, 2, 4, 6 months), and Y (1 year). B, Data were plotted in percentages for Ptx3 mRNA levels, respectively, in relation to the mRNA levels of the β-actin gene, which was used as an internal standard. The data (n = 4) are presented as the mean ± SEM. †p < 0.05 and ††p < 0.01 represent the result of unpaired Student's t test for WT versus D2R−/− mice. NurRE-dependent transcriptional activation of the luciferase reporter gene after D2R stimulation in HEK293T cells. A, HEK293T cells were transiently transfected with either a combination of D2R and Nurr1 or Nurr1/D2R alone, followed by D2R stimulation with various dopamine concentrations. B, C, Effects of the haloperidol (1 μm) (B) and effect of the PTX (100 ng/ml for 12 h) (C) on the D2R-mediated NurRE-dependent transcriptional activation of the reporter gene. 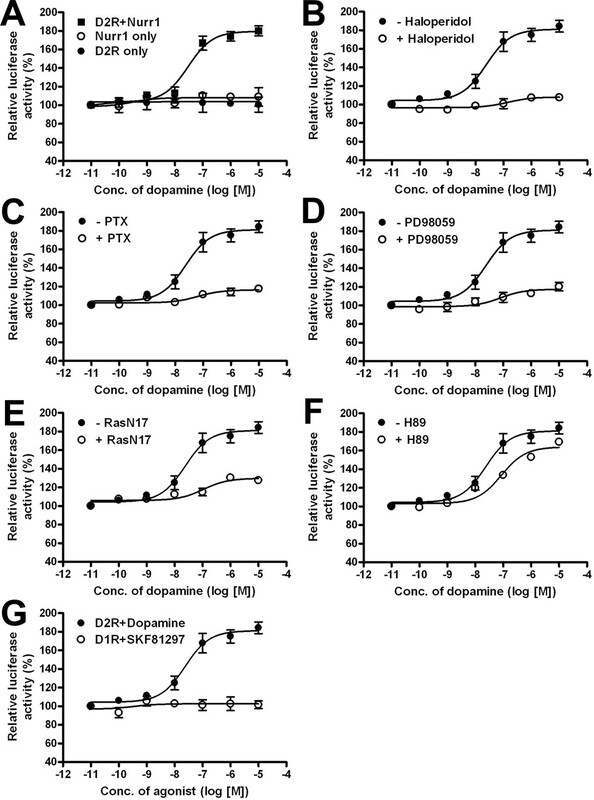 D–F, Effect of MAP kinase kinase inhibitor PD98059 (10 μm preincubation for 30 min before the dopamine stimulation) (D), of RasN17 expression (E), and of PKA inhibitor H-89 (1 μm preincubation for 20 min before the dopamine stimulation) (F) on the NurRE-dependent transcriptional activation of the luciferase reporter gene after D2R stimulation. G, Similar experiments were conducted with the dopamine D1 receptor. HEK293T cells were transiently transfected with either a combination of D1R and Nurr1 or with Nurr1/D1R alone, followed by D1 receptor stimulation with various dopamine concentrations. Data are expressed as the means ± SEM from at least five independent experiments. 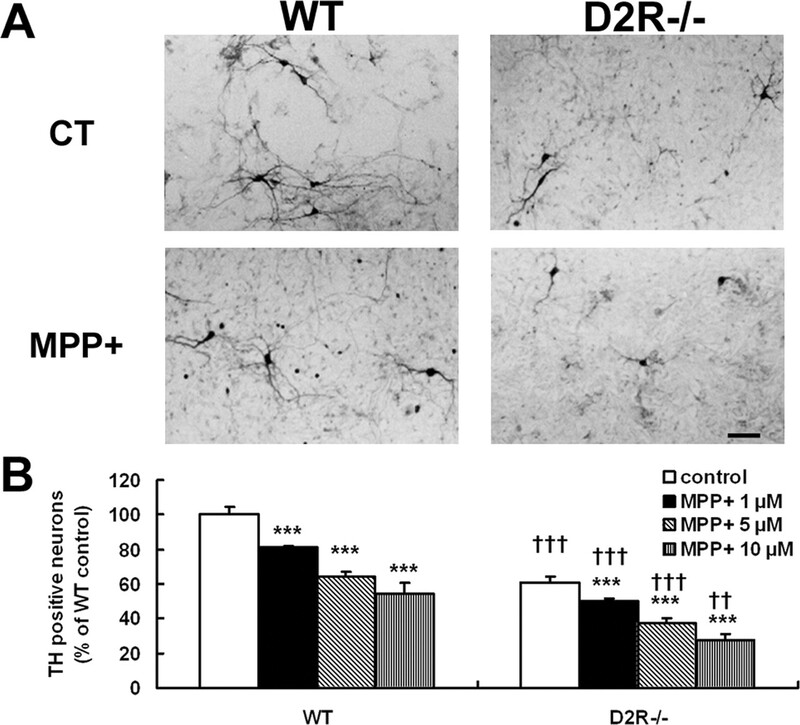 Dopamine D2R stimulation increases the number of TH neurons and enhances morphological changes in the cultured mesencephalic neurons. A, Treatment with quinpirole (Q), haloperidol plus quinpirole (H+Q), PD98059 (PD), and PD98059 plus quinpirole (PD+Q), with a control group (CT) on the mesencephalic neuronal cultures from WT and D2R−/− mice. The TH neurons were visualized via immunohistochemistry. Scale bars, 50 μm. B, Effect of treatment with quinpirole (Q), haloperidol plus quinpirole (H+Q), PD98059 (PD), and PD98059 plus quinpirole (PD+Q), with control group (CT) on the numbers of TH-positive neurons in mesencephalic neuronal cultures from WT and D2R−/− mice. C, Effects of treatment with quinpirole (Q), haloperidol plus quinpirole (H+Q), PD98059 (PD), or PD98059 plus quinpirole (PD+Q), with control group (CT) on the average length of the neurites of TH-positive neurons in mesencephalic neuronal cultures from WT and D2R−/− mice. The mean values ± SEM are shown for WT, n = 5, and D2R−/−, n = 5. ∗p < 0.05; ∗∗∗p < 0.001; ANOVA followed by a Newman–Keuls test for control versus drug-treated cells. †p < 0.05 and †††p < 0.001 represent the result of unpaired Student's t test for WT and D2R−/− mice. 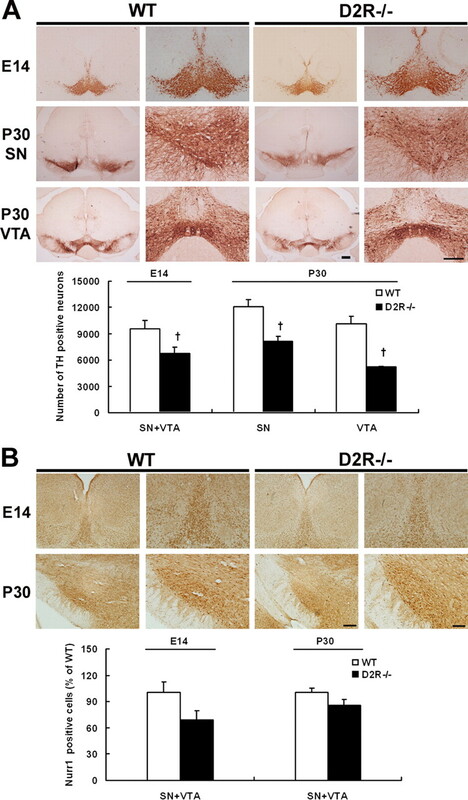 ERK activation induced by dopamine D2R stimulation in mesencephalic dopaminergic neurons from WT and D2R−/− mice. A, Representative immunofluorescence images on the effects of quinpirole treatment on the colocalization of p-ERK and TH-positive neurons from WT and D2R−/− mice. Mesencephalic cultures from WT and D2R−/− mice were treated with quinpirole (Q), after which the cells were fixed and immunostained with anti-TH antibody and phospho-ERK antibody. Colocalization of p-ERK immunoreactivity within TH-positive neurons was marked by an arrowhead. B, C, Representative Western blot and quantitative relative intensity analysis from Western blot analyses of phospho-ERK and total ERK levels of mesencephalic neuronal cells from WT and D2R−/− mice. The cells were treated as follows: CT, control; Q, 10 μm quinpirole; H+Q, 10 μm quinpirole with 1 μm haloperidol; PD, 50 μm PD98059; PD+Q, 10 μm quinpirole preincubated with 50 μm PD98059. Data represent the mean ± SEM from more than four independent experiments. ∗∗∗p < 0.001, ANOVA followed by a Newman–Keuls test for control versus drug-treated cells. †p < 0.05 and ††p < 0.01 represent the result of unpaired Student's t test between WT and D2R−/− mice. Colocalization of Nurr1 with TH-positive neurons after D2R stimulation in the mesencephalic neurons of WT mice and D2R−/− mice. Mesencephalic cultures from WT and D2R−/− mice were treated with quinpirole for 6 h, after which the cells were fixed and immunostained with anti-TH antibody and Nurr1 antibody. 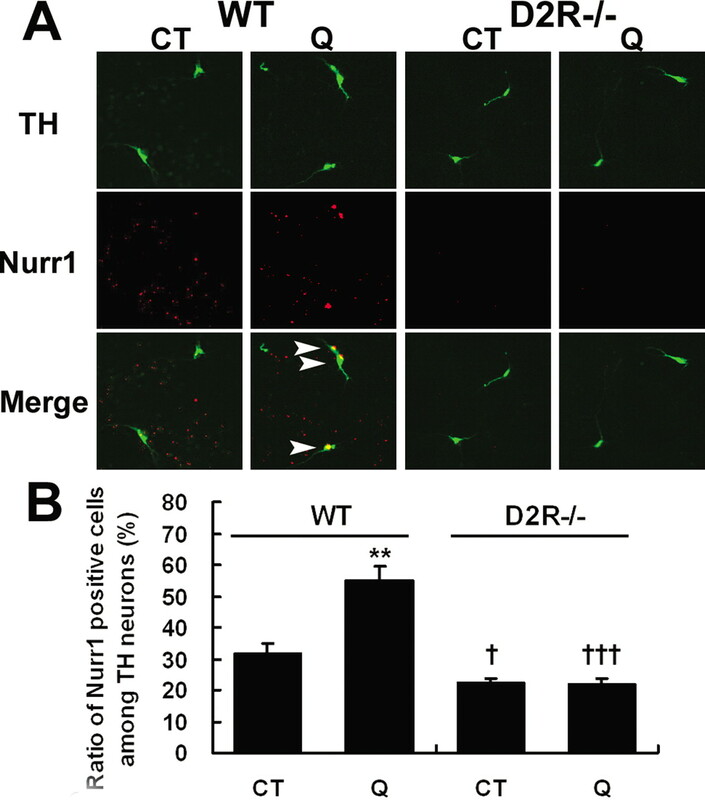 A, Representative immunofluorescence images by confocal microscopic analysis, showing the effects of quinpirole (Q) treatment on the colocalization of Nurr1 and TH-positive neurons from the WT and D2R−/− mice. Colocalization of Nurr1 immunoreactivity within TH-positive neurons was marked by an arrowhead. B, Quantitative analysis for the ratio of Nurr1-positive cells among the TH-positive neurons. Data are expressed as means ± SEM from more than six independent experiments. ∗∗p < 0.01 represents the result of paired Student's t test for control versus drug treated. †p < 0.05 and †††p < 0.001 represent the result of unpaired Student's t test for WT versus D2R−/− mice. supplemental material - Supplementary Figure 1. The relative ratios of Tyrosine hydroxylase (TH) positive cells after treatment with 1-methyl-4-phenylpyridinium (MPP+) were presented. Percentages of MPP+ treated TH positive cell number (filled bar) based on control TH positive cell number (set at 100 %) from mesencephalic cultures of WT (n=5) and D2R-/- (n=7) embryonic mice, each as a percentage of its own control, after treatment with 1-10 �M of MPP+ are expressed as the mean � SEM (� p< 0.05, �� p< 0.01, and ��� p< 0.001 represents the result of unpaired students t-test for WT vs D2R-/- mice). supplemental material - Supplementary Figure 2. 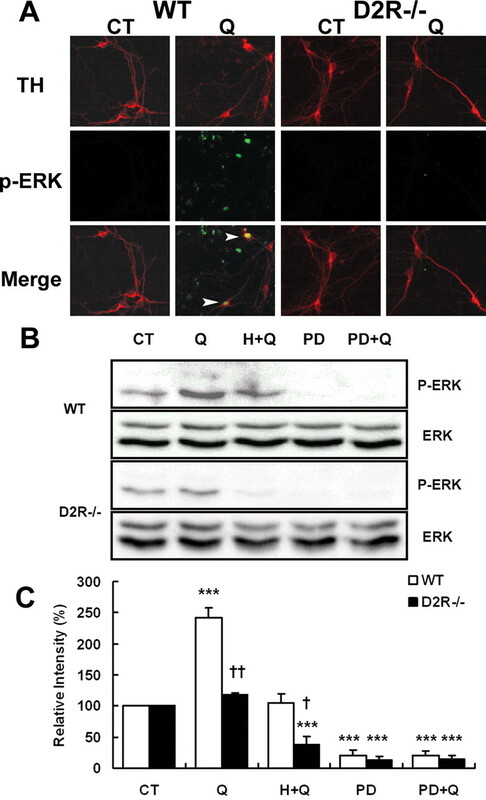 Proposed signaling pathways and the role of mesencephalic dopamine receptor D2R in the development of mesencephalic dopaminergic neurons The stimulation of dopamine D2R induces the activation of ERK. Subsequently Nurr1 is activated by ERK, then activated-Nurr1 can induce TH gene expression in mesencephalic dopaminergic neurons. The inhibitors of MAPK signaling pathway and specific antagonist of D2R, which were used in this study, are indicated.